Australian smart technology that harvests blast furnace waste and converts it into a new product to make cement, is being trialled for commercialisation in China where 60 per cent of the world’s iron waste is produced. Mark Cooksey: Steel making is one of the world’s largest industries and it produces over 300 million tonnes of slag every year. So slag is the waste product from iron making. At CSIRO we spent more than a decade working on advanced technology to deal with that slag in a way that’s more environmentally friendly. The current methods are dump it on the ground which is perfectly acceptable. It’s not hazardous but that means you waste a large amount of material that could be used for another use and you lose all the heat, a gigajoule of heat for every tonne of slag. The other way of dealing with slag is to granulate it using water. This produces good granules that can be used for cement manufacture. The trouble is you use 1,000 litres of water for every tonne of slag so that’s a large environmental cost. What we’ve developed here is dry slag granulation. We can granulate the slag, produce a good quality product that can be used for cement manufacture but do it in a way that doesn’t involve water. If you use our products to produce cement for each tonne you use you basically save 800 kilograms of CO2 emissions. Our dry slag granulation technology involves pouring molten slag from above our rig down to a spinning disc. 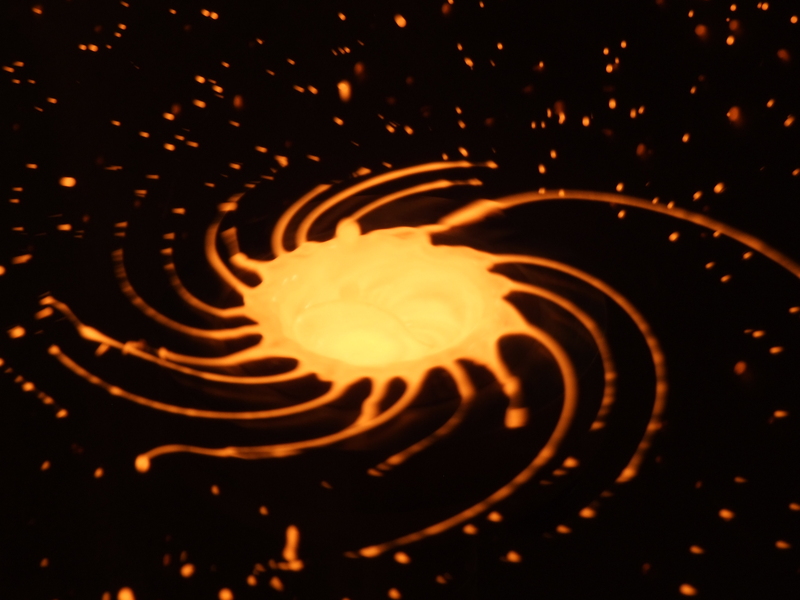 That disc is spinning at high speed and it atomises the molten slag into small granules. They solidify as they are travelling through the air and are collected in a taurus that surrounds the disc. The really smart bit of the technology is the disc. That involved a lot of computer modelling and design to come up with a disc that can produce consistent granules reliably. Other people that have worked on this technology have struggled with that part of the process. Air is used to blow the granules around the taurus. The granules are ultimately collected from various points and the hot air is extracted out of the top and that’s how we recover the heat energy. Prof. Gang Wei: We have developed in partnership with a Chinese company M.C.C.E. Through this collaboration we can commercialise CSIRO needing technology to benefit both nations through reducing carbon dioxide emission and to save water and most importantly recover energy as well. And at the end of the day it’s a global benefit for the society. Jonathan Law: We’ll be working with a company called M.C.C.E. in China. China produces 50% of the world’s steel and they will be developing a pilot facility at one of the Chinese steel facilities to test this technology and then to take it to market, first in China but ultimately around the world. This collaboration could be really important for a number of reasons. Firstly it brings Chinese production technologies together with Australian science and secondly if implemented around the world it’ll have a huge impact on water and energy use and greenhouse gas emissions. Just to give you an example, if this technology was deployed everywhere in the world it would equate to about 14% of Australia’s annual energy usage, about 10% of Australia’s greenhouse gas emissions. The success is based on the CSIRO flagship programme. This lets us think strategically about what the important technologies Australia and the world will need in the future and dry slag granulation is a great example of us thinking about a demand in the future, working with our scientific collaborators to get the technology to a commercial ready stage and now we’re ready to commercialise it. The signing of the agreement, to demonstrate CSIRO’s Dry Slag Granulation (DSG) technology at industrial scale, is a landmark for Australia-China research collaboration and for environmentally friendly metal production, according to CSIRO Director of the Mineral Resources Flagship, Jonathan Law. “Our collaboration is an exciting step towards the uptake of an innovation with real prospects of transforming the productivity and environmental performance of global iron smelting,” Mr Law said. The process produces a ‘glassy’ product that is ideal for cement manufacture, but has significantly lower associated greenhouse gas emissions than cement produced by conventional methods. “The benefits each year from full commercialisation and adoption of DSG technology are in the order of 60 billion litres of water, 800 petajoules of heat energy and 60 million tonnes of greenhouse gas emissions,” Mr Law said. 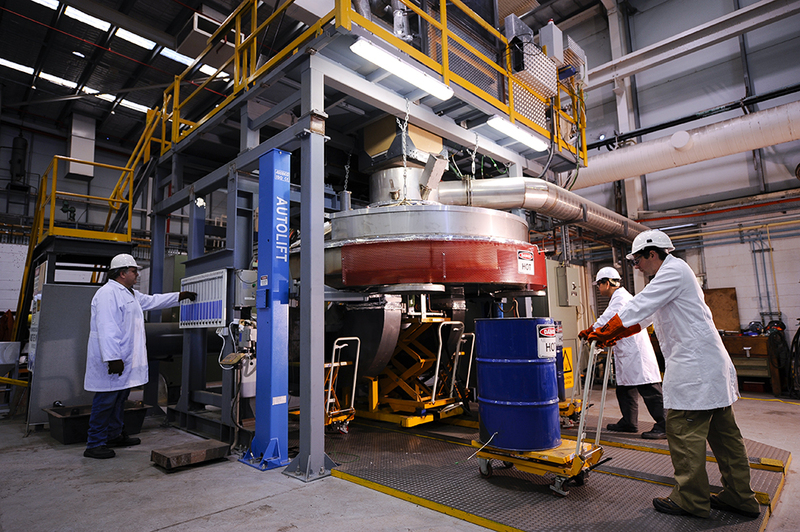 In entering the collaboration with MCCE, CSIRO has recognised the R&D reputation of the Beijing-based company and its ability to scale-up the technology and introduce it into China - where 60 per cent of the world’s 300 million tonnes of iron blast furnace slag is produced each year. “DSG is just one of the CSIRO innovations in sustainable steel production and one of many solutions we have found for national and global challenges in the minerals industry,” Mr Law said. The dry slag granulation rig is fitted to blast furnaces to produce granulated slag and heated air.